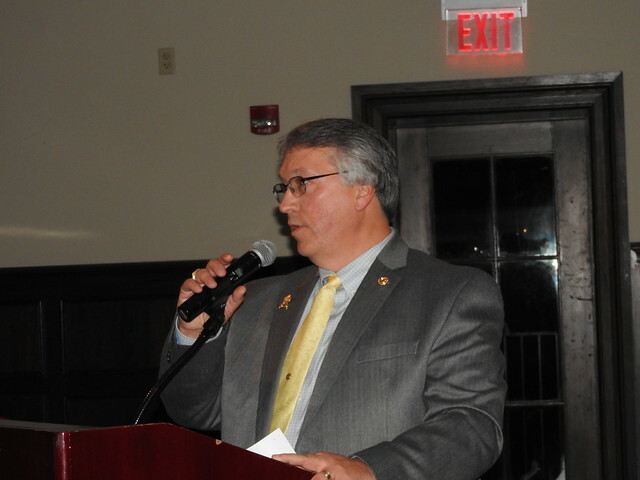 The Eastern NY Lumber Dealers Association (ENYLDA) held their annual meeting on Thursday, September 27th at the Prime Restaurant at Saratoga National Golf Course. Jay Curtis (Curtis Lumber) was honored as the Lifetime Achievement Recipient. Assemblywoman Mary Beth Walsh presented Jay Curtis a proclamation for Curtis’ support of the local community, and Senator James Tedisco delivered a Citation for outstanding family business as fifth generation and in business for over 35 years. Doug Ford (Vice President of Curtis Lumber) delivered a humorous and thoughtful presentation, and attendees enjoyed a video of Jay’s accomplishments and community supported events. NRLA President Rita Ferris thanked Jay for his support of the industry and especially with the NRLA. Larry Stephenson lead the election of officers and Kevin Porter (Hood Distribution-McQuesten Division) started his term as the newly elected president. The Past President plaque was presented to Rich Keating (Curtis Lumber). ENYLDA wishes to Congratulate Jay Curtis as the Lifetime Achievement award recipient and thank it’s 2018 Sponsors. ENYLDA’s next event is the Holiday Trade Show in Saratoga on December 4th, and will recognize their Vendor of the Year, Huttig Building products.